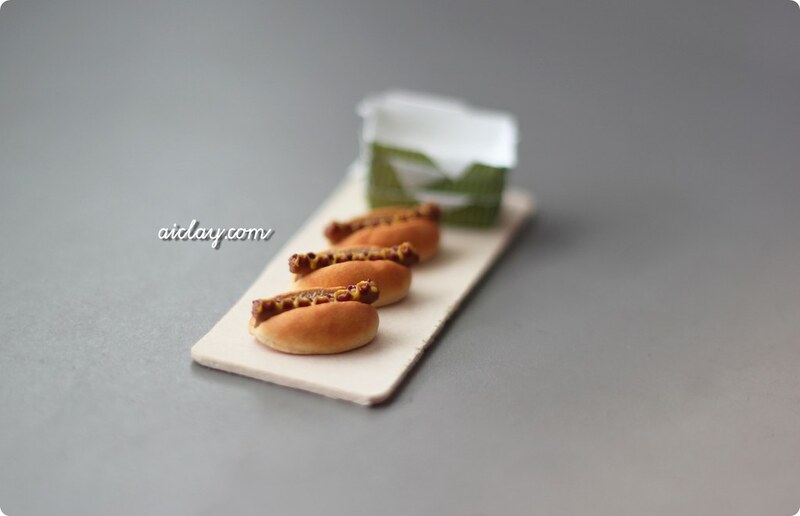 AiClay - a Haven of Miniature Food: It's a hot dog, no a sausage, no waitt a bratwurst! It's a hot dog, no a sausage, no waitt a bratwurst! Never mind what it's called, it's just really tasty eh. And I love them meat when it's packed in a bun and with a squeeze of mustard and chilli. Mmmm. 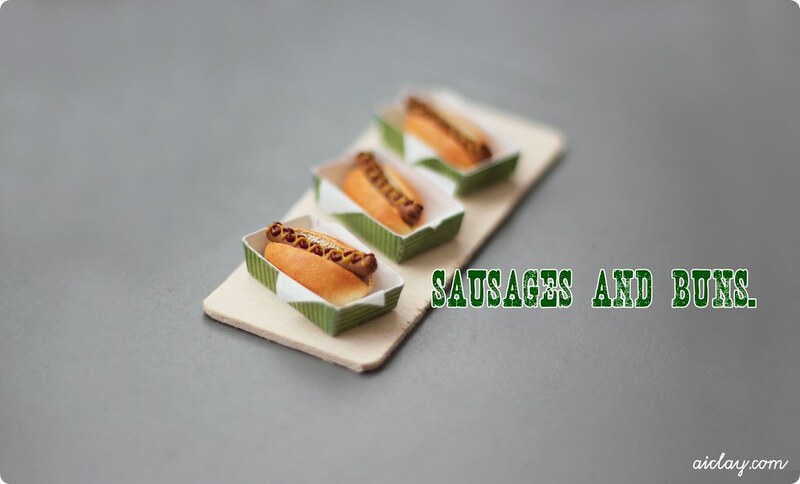 Miniature hot dog/sausage/bratwurst bun handsculpted by me. Miniature packaging designed and handmade by me too. It's about 2cm in length by the way. But I've got a few of them hot dog buns, so here's another one in store! Today was the first official day I introduced someone new into the AiClay team (hello Jackie if you're reading this! ), and she came over to my workspace for a training session and to help in painting some miniature baskets for next week's workshops. Picture of the mess we made, from my instagram. Follow me there, my username's joceaiwei! It was really awesome to have someone to chat to while working on AiClay, and I'm already envisioning a bigger workspace next time with a bigger AiClay team. Working on sculptures, marketing, packaging etc. Of course, there is still quite a while to go before AiClay reaches that, especially with the staggering rental cost of a workshop in land-scarce Singapore. P.S The workshops are held by Hwa Chong Institution so they aren't open for the public. To everyone who has been waiting for the workshops, I'm working on conducting one in November! -fingers crossed! I say Bratwurst but just because I was born in Germany huhu! Hi Stephanie! ♥ I know how busy you get so thank you for leaving a comment here! :) and thank you, I'm drooling over your works in fb too! mmm.